I should have known that the crazy Art Deco tower at 4157 South Figueroa was more than just some 1930s folly (figure 1). When the original permits came back from the city’s Building and Safety department, it was so obvious. Of course this was one of the Van de Kamp’s Holland Dutch Bakery sites. 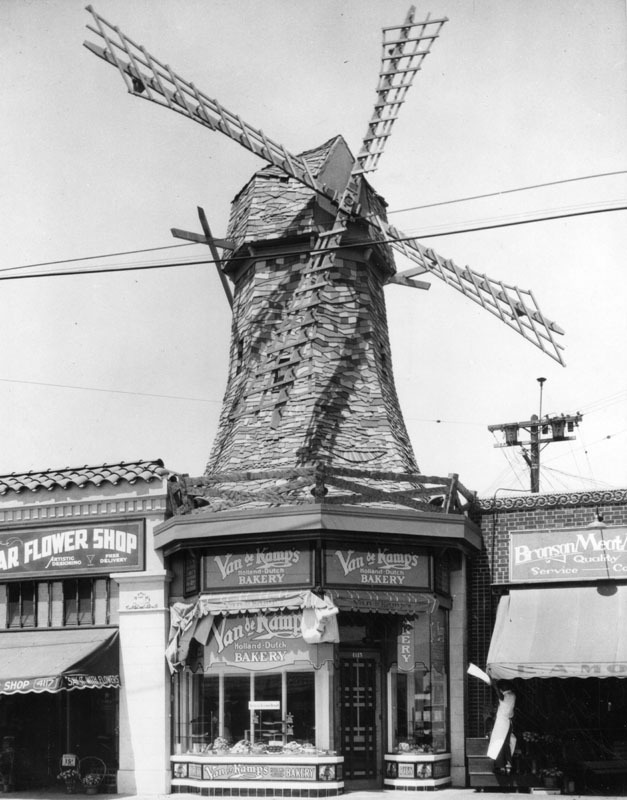 Along with hot dog stands that looked like hot dogs and restaurants in the shape of bowler hats, the Van de Kamp’s windmill was an icon of LA’s early twentieth century roadside architecture. The windmill served as the company’s logo and principal design motif. Over the years, the theme was updated and refined to reflect new tastes. The earliest Van de Kamp’s buildings, designed by Hollywood art director Harry Oliver (1888-1973), used a picturesque, story book architecture (figure 3). 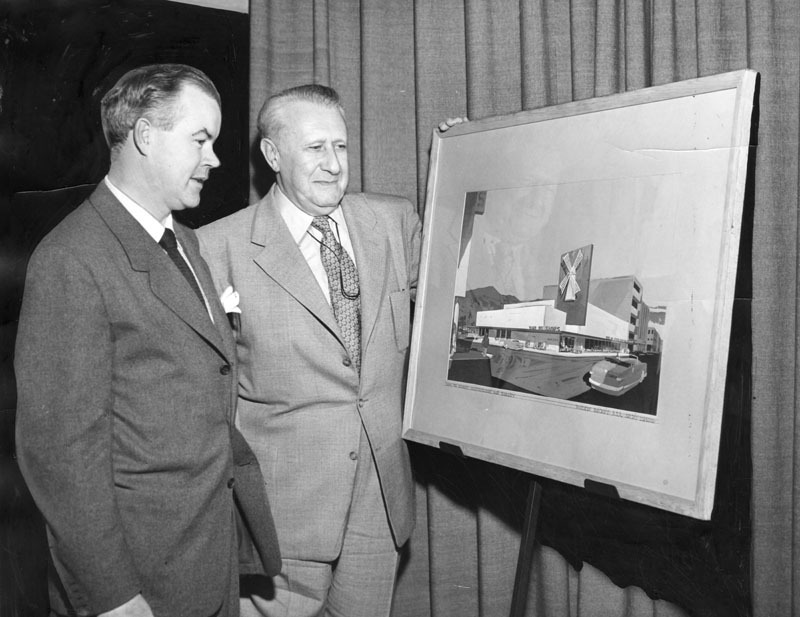 [v] In the 1940s, Googie architect Wayne McAllister (1907-2000) created a drive-in coffee shop in Atwater Village (figure 5) and in the 1950s, Welton Becket (1902-1969) designed sleek modern restaurants for LA’s Miracle Mile area (figure 6). 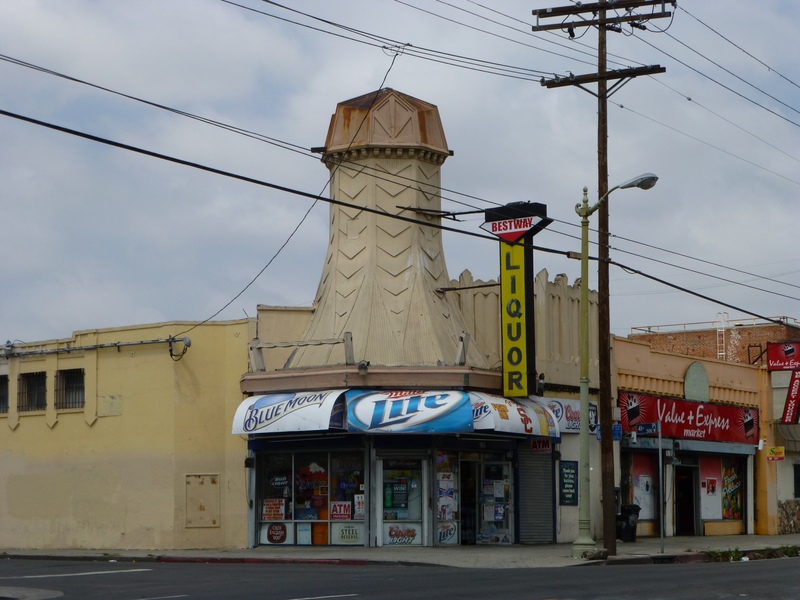 The structure on Figueroa was part of a group of projects that employed an Art Deco style (figure 4). 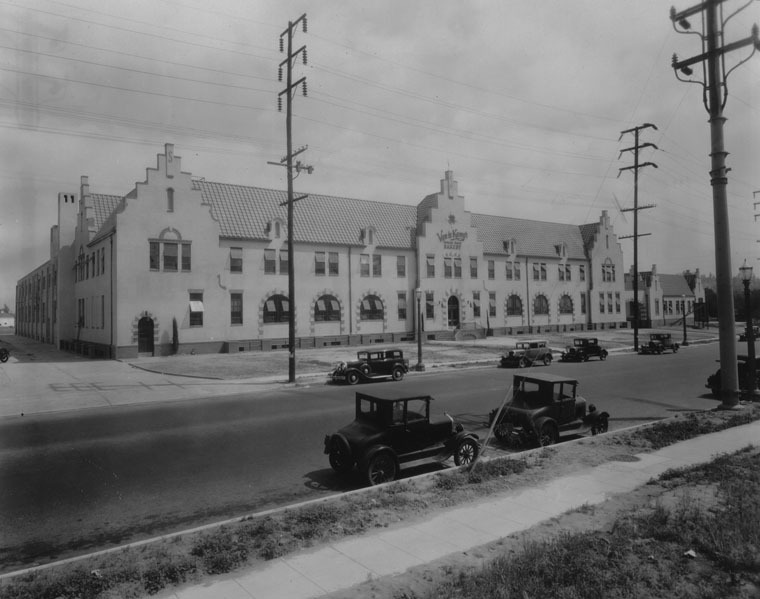 Building permits were issued in 1930 for the construction of new stores at 4153, 4155 and 4157 Figueroa. The firm of Nordstrom and Anderson was listed as the architects. [vi] Nordstrom and Anderson, who also designed the Sontag Drug Store and the Aero Industries Technical Institute, had developed an extremely successful local practice focusing on commercial and industrial architecture. [vii] It seems likely that the firm also designed the Van de Kamp’s windmills, but it is hard to say for sure. The company is not listed as the owner of 4157 Figueroa until 1932 when permits were submitted to change awnings and add tile bulkheads. It is possible that Nordstrom and Anderson designed the shops and the windmill was added later. Of the 50 Van de Kamp’s locations listed in the 1932 LA City Directory, this tower is the only survivor. Most of the buildings have been demolished; many have become parking lots. Many more have become gas stations, probably because of their strategic location on LA’s busiest intersections. The Van de Kamp family sold the bakeries to the General Baking Company in 1956. In 1979 it was sold again, this time to private investors. The company filed for bankruptcy in 1990. 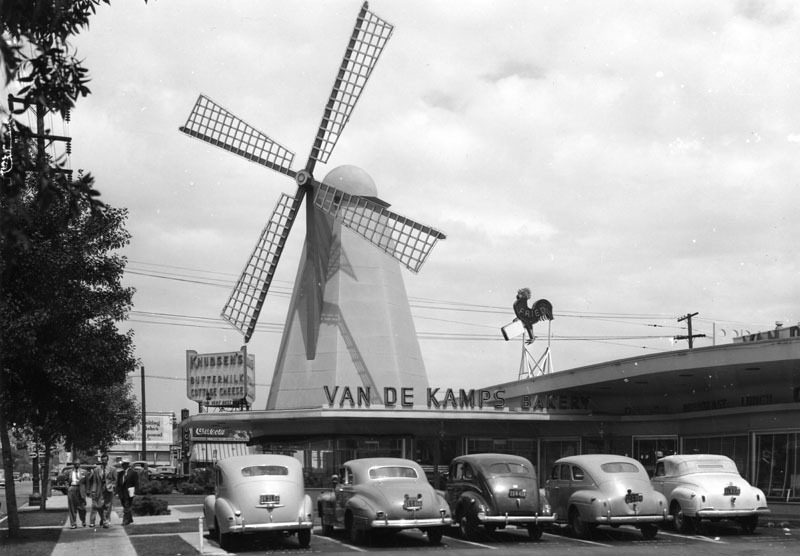 The Van de Kamp’s brand is still used locally by Ralphs supermarkets for their line of donuts and baked goods. The coffee shops were bought by the Tiny Naylor’s restaurant chain which was later absorbed by Denny’s. 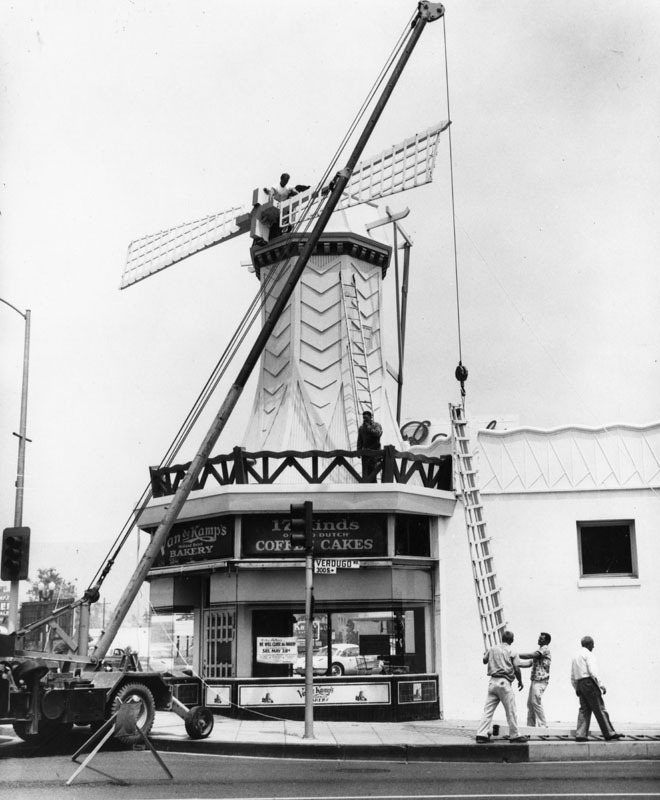 The last windmill with its sails intact can be found on a Denny’s on the corner of Huntington and Santa Anita in Arcadia. [ii] http://blogs.dailybreeze.com/history/2011/10/13/van-de-kamps-bakeries/. Besides the bakeries, the family also founded the Lawry’s Restaurants and the Tam O’Shanter Inn. [iii]“Financial: Dutch Bakeries Show Headway Sales Gain on 1929…” Los Angeles Times (1923-Current File); Dec 9, 1930, pg. 12.